I really don't have much to say about the writing in this one. It's one that I hear highly praised from many people, and I certainly enjoyed reading it, but nothing jumped out at me in the writing. It didn't stand out above and beyond any other YA fantasy I read this year, but there were also no problems with it. It's another case of being so into the story that the writing didn't stick out one way or the other. I do think the author did an exceptional job of capturing a unique voice with Karou and Zuzana in particular, but I wasn't a huge fan of Akiva's dialogue. He didn't stand out to me the way Karou and Zuzana did. Mind-blowing. I was SO INTO this story. 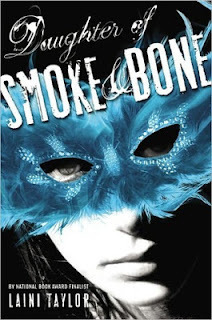 I loved the characters, especially Zuzana, Karou's best friend. I think the voices were fresh and original. In a lot of YA I think you could switch characters around and the dialogue would still match. You could put one author's character in another author's book and no one would ever know the difference. But Karou is totally unique. I also think the story itself is fascinating and new in a genre that is populated by so many similar stories. As a bonus, there is no love triangle, which was very refreshing. I highly recommend reading it, especially as a "fun" read. Make sure you have plenty of reading time on your hands because you won't want to put it down. And be prepared for a bit of a wait - the second book is out, but the final book in the series won't be released until next year. YA with no love triangle? Okay, I'm reading it. 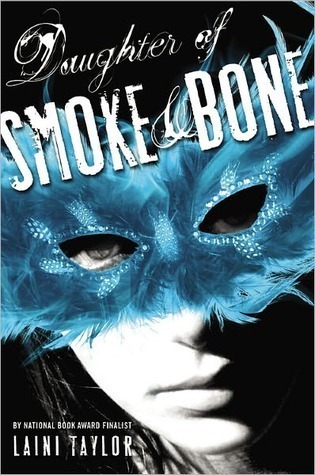 It's definitely not your typical YA read - I highly recommend it. I'm so glad you ended up loving this one! Me too! But I'm making myself wait until the third book comes out before reading the second.